Yep. 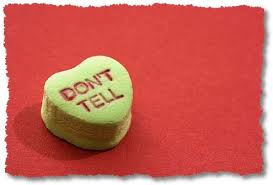 Don’t tell anyone. These are direct orders from the top – Jesus Himself. Wait, aren’t we ALWAYS supposed to be telling people about Jesus? Well, apparently not always. When should we and shouldn’t we? When is it not right or best? Join us at TD this Friday as I teach from Luke 5:12-16 and address this issue. The message is titled, “‘Tell No One About Me’ – Jesus” We’ll have a great time uncovering the truth and sifting through the various thoughts about this, as well-intentioned as they may be. Flash is in. Swag? Yep. Gaudiness? You bet. Shock value? A dime a dozen. But what about beauty, true beauty? That is a rare find. And rarer still is the one who is persistent enough to pursue it and patient enough to wait for it, for it comes FROM the deep TO the deep. It is not always easy to talk about beauty without a minefield of objections or at best complicating list of qualifiers. Its modern place in the “eye of the beholder” gives it a tenuous feel at best. While Henderson describes a world without classical music as soul-less, others may not miss it so much. And yet it is hard not to talk about beauty in a broken and breaking world that makes its distinctive encounters increasingly stand out. One author describes the common, but individual, effect of our varied encounters of the beautiful this way: “‘Beauty’ seems suited to those experiences that stop us in our tracks. Whether it’s a painting called Broadway Boogie-Woogie or a scherzo by Paganini, the beautiful is conducive to stillness. It doesn’t excite us, or necessarily instill in us the desire to replicate it; it simply makes us exist as though we’re existing for that very experience.”(2) His words are rife with the power of beauty to create longing, a desire to somehow participate. Beauty indeed leaves us with the ache of longing for another taste, another glimpse. And for each of us, this longing can come at unique or unsuspecting times—at the spectacular sight of the giant sequoias or a tiny praying mantis, at a concert or watching a First Nation powwow and taking in the colors, the drums, the survival of a betrayed people. But to suggest that beauty is simply a spectator’s preference, an individual’s pursuit of an abstracted and timeless ideal, is to miss something significant. What of those moments when beauty is neither pleasant nor pretty, but haunting? What of the communal ache of beauty? The well-known scene in Elie Wiesel’s account of the Holocaust when describes a young man named Juliek, an incredibly gifted violinist from Warsaw. Wiesel describes the night when Juliek, on the brink of death, played a Beethoven concerto in the dark for that group of dying, starving men. Wiesel remembers the intensely beautiful, sad and haunting music, noting that it was as if Juliek was playing his very life upon that violin, offering a lament for each of them. Their encounter with the beauty of the composition was humanizing, made all the more jarring in such a dark and dehumanizing setting. In the morning they woke to find Juliek dead, his violin crushed on the floor beside him. The Christian worldview offers a God who not only made the beautiful, whose glory offers glimpses, but the God who can take away brokenness, and transform a disordered creation in Jesus Christ. This is a God who takes all the glimpses and introduces the whole—not as an escape from reality but a deepening of it. For the beauty of God is one that can hold life as well as death. I remember vividly one summer when I was working with a group of kids in an afterschool program and a young girl was stung by a bee. She had a severe reaction and the paramedics were unable to revive her. Sitting with one of her young friends at the funeral, somewhere in the middle of it she turned to me with tears in her eyes and said, “The cut on her face will never heal.” The young girl had a little cut on her forehead from some previous playground encounter, and her friend made this observation in the midst of her own shock and grief. I remember thinking how incredibly insightful her words really were. She was noticing something very simple, but there was something quite profound in her thought. She seemed to be saying instinctively that this wasn’t right, that wounds are meant to heal, that the broken parts of life are not okay: indeed, that wholeness is both our stubborn longing and profound calling. Remarkably, in this little girl’s comment is something that every prophet in the Bible has said—the ones who were trying desperately to open the people’s eyes to the glory of God around them and the ones who were pointing out the absence of glory. Each of them looked around the world, and seeing its broken cuts and ugly blemishes, cried out instinctively, “This is not the way it’s supposed to be!” We were made for wholeness. Perhaps beauty has an effect on us because it hints at this beauty of God, manifestations that come not intangibly but, like Jesus Christ, within time and community, and thus a beauty that transforms, a beauty that is able to embrace life as well as death. Whether a fleeting glimpse in the subway or a quiet act of kindness, whether something that stirred a community or stood up to a culture, each of these dim glimpses suggests not an escape from reality but a calling further into it, such that when we see the face of God we shall know that we have always known it. (1) Pia Catton, “A Musician for the Masses Improves His Station,” Wall Street Journal, December 31, 2010. (2) Arthur Krystal, “Hello, Beautiful: What We Talk About When We Talk About Beauty,” Harpers, September 10th, 2010. (3) Jeremy Begbie, Voicing Creation’s Praise: Towards a Theology of the Arts (New York: T&T Clark, 2006), 224. Passion Week Podcast: Day 2 – Why the Atonement? 10 Mins a Day During Passion Week! It’s Passion Week. Can you offer the Lord 10 minutes a day this week as an act of worship to learn and really appreciate the Lord? All week, we’ll be posting 10 minute podcasts highlighting some pertinent and powerful teaching from the series “The Cross: His Glory, Our Hope,” one of the most important series I’ve ever taught (perhaps my favorite).